This is our review of Buffered VPN based on real VPN testing results. In this review, we will cover Buffered VPN’s speed, reliability, price, free trial, software, customer service etc. In addition to this Buffered VPN review, we have also reviewed a number of other VPN services. If you are looking for a reliable VPN services to be used in China, Please also read our list of Best VPNs to be Used in China. Price is at the high-end. VPN speed is not very fast when used from China. Buffered VPN is a relatively new VPN service based in Hungary. 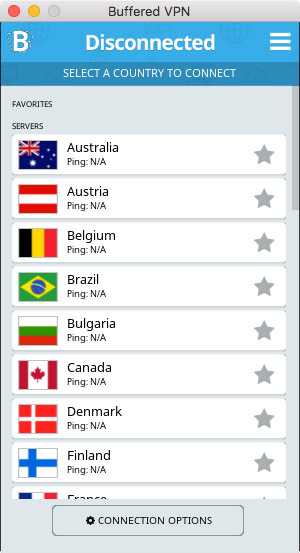 It provides common VPN features and has servers in over 30 world-wide locations. Buffered VPN offers unlimited speed, unlimited bandwidth and unlimited server changes. Currently Buffered VPN’s website is not blocked in China. Visitors can sign up Buffered VPN’s service, download their software and connect to their VPN servers from China. Buffered VPN’s website and software are in English. Basic English skills are needed to sign up and use their VPN service. Buffered VPN has servers in 30+ countries. For U.S., it has servers in both the west coast and the east coast. For Asia, Buffered VPN owns servers in Singapore, India and Israel etc. Buffered VPN currently does not offer servers in Japan or Hong Kong, which are two common server location choices for China VPN users. For VPN protocols, Buffered VPN only supports OpenVPN. It has a no-logging policy and none of their users’ activity is logged. For simultaneous connections (also called multi-logins), Buffered VPN allows up to 5 devices to be connected at the same time. 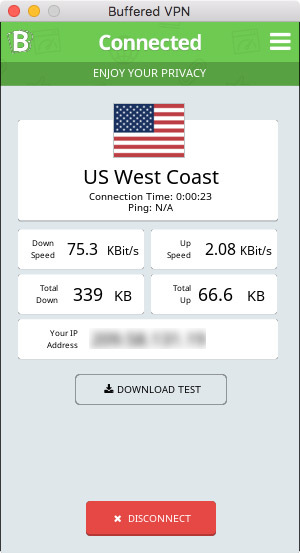 Buffered VPN’s users can connect from computers, tablets and smartphones using their software (currently no apps) or setting up VPN manually. Currently Buffered supports Windows, Mac, Linux, IOS and Android etc. Buffered VPN’s price starts at $8.25 per month (if you pay annually). Their bi-annual plan costs $9.99 per month and their month-to-month plan costs $12.99 per month. 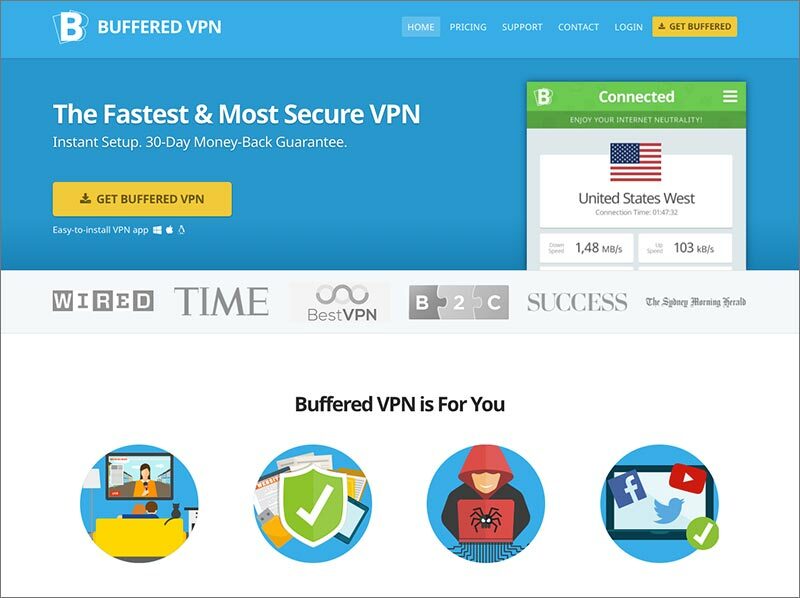 Buffered VPN offers software for Windows, Mac and Linux. In addition, installation instructions are provided for setting up Buffered VPN without installing their software on these operating systems as well as on iOS and Android. Currently Buffered VPN doesn’t offer any mobile apps. We downloaded Buffered VPN’s desktop client for Mac OS. The installation process was straight-forward and the software interface is clean and intuitive. Then we used Buffered VPN’s Mac desktop client to connect to their US West Coast server. We got a download speed of 4.31Mb/s. To be honest, this is not a fast speed. For many other VPNs, usually they offer server locations in Japan and Hong Kong, and those two locations usually provide the fastest speed when connected from China. Since currently Buffered VPN doesn’t offer these two server locations, the relatively low speed is understandable. We have also tried connecting to Buffered VPN’s other server locations. However, we ran into connection problems (connection time-out) for some of these servers, including Singapore and US East Coast. Currently Buffered VPN doesn’t offer live customer support. To get support, you can use their online form to leave a message. Buffered VPN is a relatively new VPN providers. Users can sign up their service from China and their VPN service work in China at the time of our test. Since currently Buffered VPN doesn’t offer VPN server locations in Japan or Hong Kong, their VPN speed when connected from China is not among the fastest. Buffered VPN’s price is at the high-end, but it allows 5 simultaneous connections, which is quite generous. If you are looking for a VPN service, you can give Buffered VPN a try. This entry was posted in VPN Reviews and tagged buffered vpn, review. Bookmark the permalink.